As part of next week's monthly meeting of the Sacramento Transportation Authority, Executive Director Jeffrey Spencer has issued a report on the results of the recently failed Measure B. Sponsored by the STA, Measure B sought to raise sales taxes in Sacramento County by one-half cent for 30-years. Interestingly, Spencer complains that opponents of Measure B raised "more than $35,000 in funding." What Spencer neglected to mention is that proponents of the tax increase, including a host of real estate developers, construction interests, and Sacramento Mayor-elect Darrell Steinberg raised over $1 million in their failed effort to pass the measure. As I had reported, Measure B did not surpass the required 2/3 threshold to pass. Measure B received 65.08% yes, and 34.92% no. There was a 42.54% voter turnout, or 328,744 voters, which is lower than many recent elections. In comparison, the Presidential election for 2012 had a turnout of 74.7%, and for 2008 it was 79.8%. Interestingly, there were more than 46,000 under votes, which means no vote on the Measure at all. This may be a result of the lengthy ballot, leaving Measure B to be printed on the back of the ballot. The 2/3 threshold for tax measures remains extremely difficult, despite some very hard fought campaigns. The votes received would have been a landslide in normal circumstances. This will be a topic of discussion at the next State Legislative Summit scheduled for March 2017. Already a coalition of business groups, self-help counties and others are focused on changing the Constitutional amendment. Poll results from March 2016 showed 69% support, but those results fell 8% after negative messaging. The No on Measure B campaign received more than $35,000 in funding. 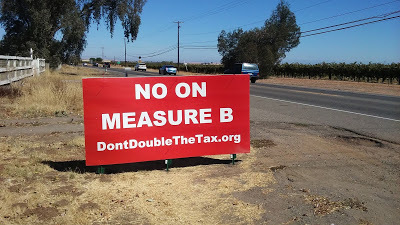 The opposition groups garnered media attention making public positions through reports they issue as an attempt to sway public opinion, even stating “Measure B was not about fixing our roads.” These news releases and reports are not always factual and can rely on conjecture. Although providing untrue statements, the general public cannot decipher the facts and may rely on this group’s opinions. Discussions with voters after the election indicated a lack of understanding in transportation needs and how it is funded, as well as apathy and repudiation of taxes. The next opportunity will be in November 2018. However, the same threshold will exist and being a mid-term election, voter turnout is not likely to be great. Meanwhile, I will continue outreach efforts to help educate the public on the needs and effects of an efficient transportation system. 1 comment to ''In Aftermath of Measure B's Failure STA's Executive Director Cries Opposition Not 'Factual, Rely on Conjecture'"
To update the facts, as of December 7th when the vote was certified by the County, the voter turnout stated was for the nation. In Sacramento County, it was 74.5%. Measure B results are updated to 65.71% Yes; 34.29% No. There were nearly 52,000 under votes - those that did not vote on the Measure. The Measure was printed on the back of the ballot. Many of those under votes were in precincts that largely supported Measure B.
I try to work on facts, communication and understanding. It is my job as a public servant.